Peel the garlic clove and give it a good whack with the side of a kitchen knife to crush it. 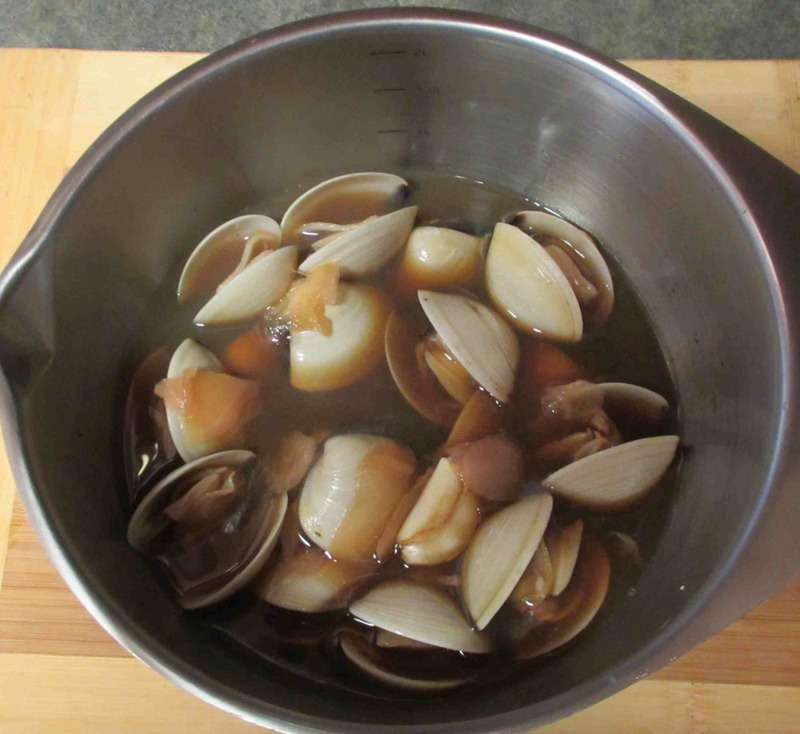 Add all the ingredients except the clams into a large measuring cup and stir vigorously to dissolve the sugar. 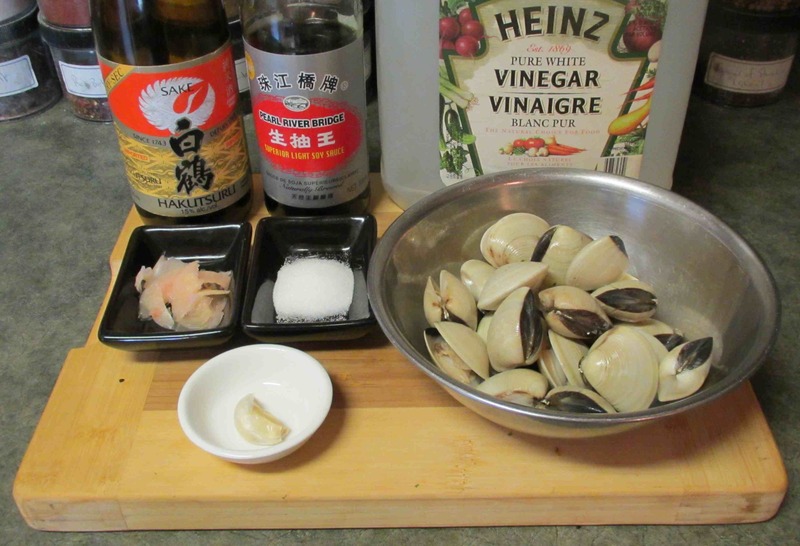 Now put the clams into a bowl with any liquor they have thrown off and pour over the marinade. Cover and refrigerate for 24 hours. 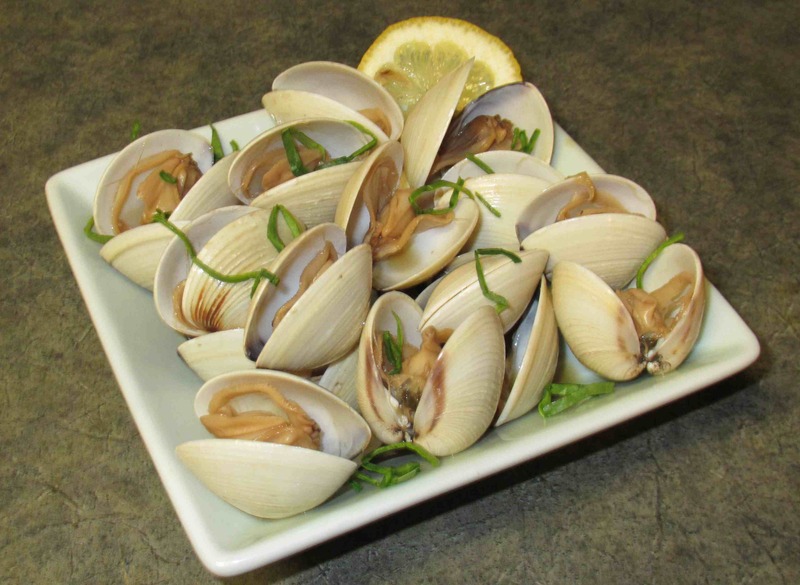 When you are ready to serve, pick the clams from the marinade and arrange them attractively in a serving dish and garnish however you like. To garnish this experiment, I sprinkled over a chiffonade of spinach leaf (all I had on hand) and a slice of lemon. I though this was pretty decent. I was a little afraid that the marinade might overwhelm the delicate flavor of the clams but the sweetness came through beautifully. My wife wasn’t sure how much she liked it when she tasted the first one but by the third she was won over. The only way I might change the dish would be to cut down on the ginger a little bit, and maybe substitute a little lemon juice for some of the vinegar. In a future experiment, I might try the same technique with either fresh clams or mussels. I adore the chiffonade of spinach here; it looks like seaweed. Very simple but pretty presentation. Sounds delicious too! Gee .. I just realized I have several kinds of dried seaweed in my cupboards. Good idea for next time. BTW … I just notice they you and I started our blogs within days of each other. You have an impressive army of followers already! I probably use that basic combo in various proportions at least once a week…marinade, salad dressing, base for a dipping sauce etc. MMM,..what a delightful & wonderful tasty recipe! The dish sings to me! Yum! Thank you … I really enjoyed it. I have some more of the same type of clam now…. gonna try grilling them maybe! This here is More than a foodie blog, it is Beautiful! So I nominate you for a beautiful Blog award!! That looks amazing! What a great recipe for the summer months down here when the sun turns the city into one big pizza stone. For something like this, I kind of like how the clams were pre-cooked. Beautiful photo! Thanx… I actually especially liked this one myself. love clams. This would be nice.